Jesus The Radical Pastor: A Ruckus of Color! What a ruckus! 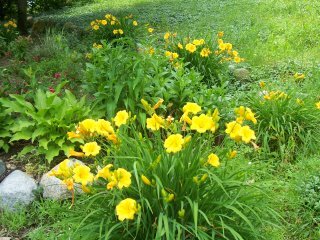 A few weeks back I promised you a "ruckus of day lilies." I can see 5 of our at least 12 plants out my window, each one as prissy as can be with blooms. "Look at me! Look at me!" they seem to be shouting, appearing like an explosion in a butter factory. 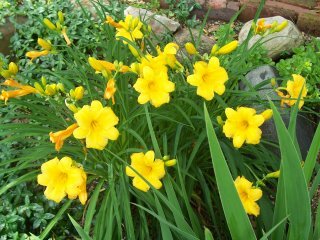 Their buttery yellow flowers are so sumptuous that I would like to put them on my pancakes and drench them in Grade B pure maple syrup. But, alas, you can't eat 'em (though I've been known to eat my share of petunias in the past). If their color were sound waves, we would be listening to the "Waltz of the Flowers" played by the band Delirious. Your garden and grass is so green and lush. ...it is so dry here in Colorado and it was an unusually hot Spring, already hitting the high 90's. You are blessed with such beauty! For some reason West Michigan this year is tropically lush and green. It is a beautiful state. Yes, the beauty in these "simple" things of God's creation, only seem to grow on one, over time. wow....almost as gorgeous as MY flower garden in Oregon...I will forward you pics..